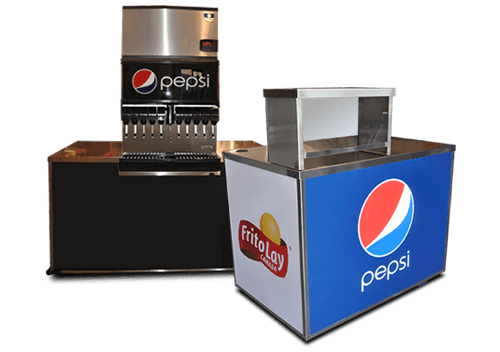 Choose from a variety of custom options to make your mobile food cart the perfect fit for your menu and style. Tow your Top Dog Cart to almost any location with a standard car or truck. Our precision balanced engineering makes it easy to travel short and long distances. 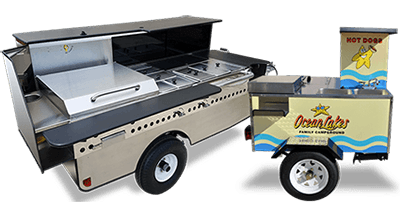 Top Dog Carts are engineered to be the most efficient carts, highest quality mobile food carts available. Our carts remain attractive and dependable even after years of steady use. 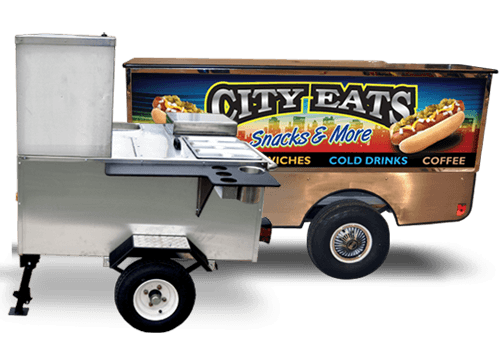 Our stainless steel hot dog carts / mobile food carts are constructed and engineered to be efficient, dependable. 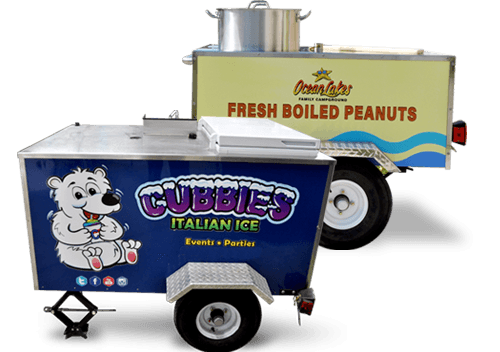 Boiled peanut carts, Sno-cone carts, Italian ice and frozen treat carts are a few of the specialty food carts we build. 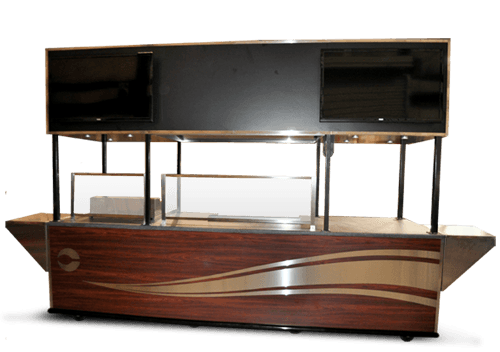 Our concession carts are built-to-spec for food and beverage companies in convention centers, hotels, and stadiums throughout North America. Mobile concession sink carts, condiment carts, bar carts and merchandise carts. Parts and Accessories for Top Dog Carts available in our online store. Shop anytime, anywhere! Logos, signs, banners and apparel – we’ve got you covered. Our on-site design team are experts at marketing mobile food cart and concession businesses. Don’t see what you’re looking for? Call 888-282-5002 or contact us to discuss your needs. 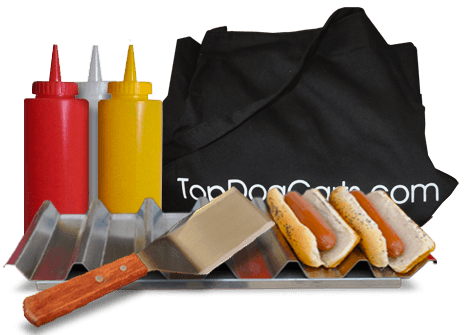 Top Dog Carts is a leading manufacturer of custom hot dog carts, mobile food carts, specialty food carts and concession carts. For over 30 years our goal has been to engineer the most efficient, durable and attractive carts money can buy. Our commitment to these principles is why we continue to be nationally recognized for the quality and dependability of our products. We do more than build great vending carts. Check out some of the other services we offer food vendors and concessionaires. 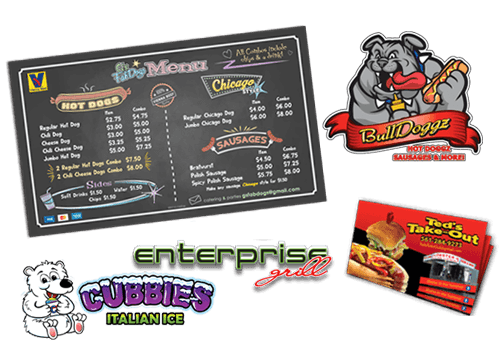 Get a custom logo, sign, menu, business cards and more for your cart. Everything you need to know about starting a mobile food business. Financing available for those who qualify through our lending partner. We’re happy to answer any questions you have about Top Dog Carts. Call 888-282-5002 or contact us for more information.